Learn the Internal fixation of ankle fracture : Fibula pro-tibia fixation technique with Stryker Variax plate. surgical technique with step by step instructions on OrthOracle. 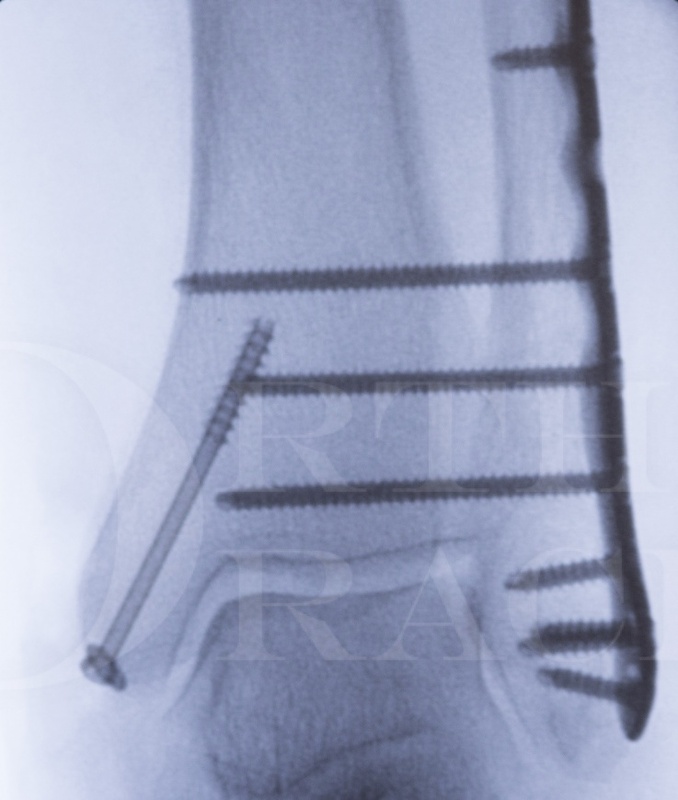 Our e-learning platform contains high resolution images and a certified CME of the Internal fixation of ankle fracture : Fibula pro-tibia fixation technique with Stryker Variax plate. surgical procedure. The management of unstable ankle fractures in the elderly is both controversial and evolving. The importance of early ambulation in this patient group, for the same reasons as in a hip fracture patient, is being increasingly recognised. Fracture-dislocations in osteoporotic bone are increasingly common with an ageing population and in order to allow early ambulation fixation techniques need to be employed which provide a higher degree of stability than is required in a younger patient cohort. With a fibula fracture the traditional technique of fixation with a 1/3 tubular plate may not allow an adequate hold on soft bone, in particular if early mobilisation is going to be aimed for. The tibia however provides an excellent “internal strut” to bolster the fibulas’ stability and the use of screws which pass from the fibula and into the tibia has been termed “fibula pro-tibia fixation”. It was originally described for fixation in the context of tibial non-unions by DeOrio and Ware (Foot Ankle Int: March 24(3) 2003. Salvage technique for treatment of peri-plafond tibial fractures: the modified fibula-pro-tibia procedure). Its use in management of the acute ankle fracture has yet to be formally published in the Orthopaedic literature, though is a technique that we have found of significant merit at the Northern General Hospital in Sheffield. Author: Chris Blundell MD, FRCS (Tr & Orth). Institution: The Northern General hospital , Sheffield ,UK.